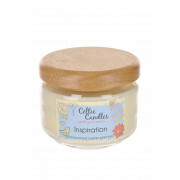 Celtic Candles present the Inspiration scented candle. A long lasting candle that will burn for up to 45 hours with no waste. The candle comes presented in a glass jar with a wooden lid that can be reused as storage after the candle is completed finished.